Natrunsfar: A big injury update - hoping for a huge pot of gold in time for St. Patrick's Day! A big injury update - hoping for a huge pot of gold in time for St. Patrick's Day! Today marks 11 weeks (yes weeks!) since my last run. Wow oh wow, this has been a roller coaster ride. A ride filled with a bag full of various emotions: shock, frustration, sadness, hope, determination, happiness, shock again and then steely resolve. If you are new to my blog, you may not know that I am dealing with a big injury. You can read a little bit more about it HERE and HERE. - January 20th - 6 weeks elapsed. No signs of healing. No Boston and left with the idea that I would have surgery to heal the injury. Question: Why would I have surgery to heal a stress fracture? 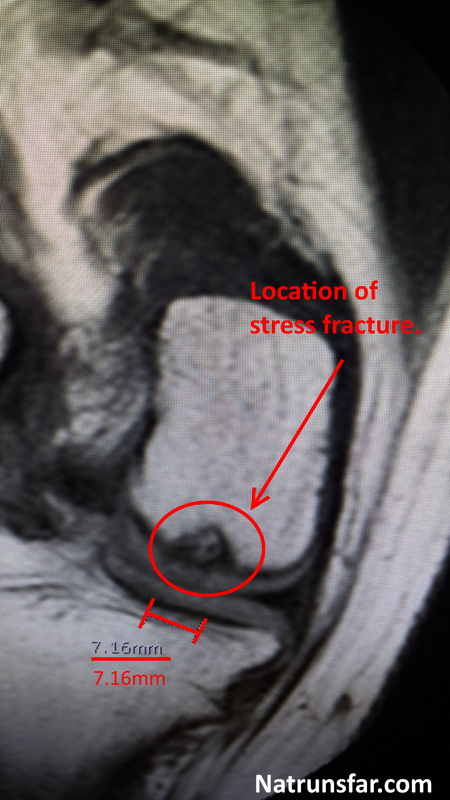 Answer: This isn't your typical stress fracture. What is happening in my right knee is called an Osteochondral Defect. Basically what has happened is a piece of the cartilage and a piece of the bone in my knee has died. In addition, it isn't getting the blood flow that it needs to heal. It think it is pretty interesting! You can read more about it HERE. This type of injury is very rare. My doctor told me that there are millions and millions of runners in the world. This type of injury happens to only a few. A few. I am one of the few. The solution from my doctor was that he would take stem cells from my hip bone and insert them into my knee. This would allow blood flow and healing to the injury. 6 weeks of crutches and 4 months total of recovery and I would be back to running again. After I initially left the doctor's office in January, I was gung ho to go ahead with the surgery and there was talk of having it done within a week. Then, I went home and thought a lot about it. Was there another way for this injury to heal besides having surgery? Would more time off do the trick? Should I get a second opinion? Do more research? Question: What causes this type of injury? I felt that I needed to get a second and even third opinion before I made my final decision on the surgery. I realized this is pretty serious, and could effect my knee and my running (so important to me!!!) long term. Today I was very fortunate to talk to two different doctors about the situation. Both are family friends - one is an orthopedic surgeon who specializes in elbow and shoulder injuries. He studied my MRI results and consulted with another doctor who deals with knee injuries. 1. He said to me that although this was not his area of expertise, he felt like surgery would be my best option. BUT - there are different surgical approaches and he wanted to make sure that I am taking the right approach. One concern was that if I took approach #1 with my current doctor (who he said he heard great things about!) - taking stem cells from my hip bone and inserting them into the knee - he was concerned with the cartilage replacement. He felt like stem cells alone may not hold up for my knee in the long term. Cartilage replacement needs to come from somewhere - my own cartilage or from someone else. This doctor felt like I should definitely get another opinion and gave me a name of a fabulous ortho surgeon in San Diego. His question: Would I be willing to go to San Diego to meet with this doctor? Course of action: Calling this San Diego doctor and taking a trip to see him ASAP. Happiness point: A trip to San Diego! 2. The second doctor that I talked to today was another family friend who is a radiologist who has about 40 years of experience. He is not an ortho surgeon, but he has a good friend who heads up an ortho dept. (and specializes in the knee) in New Mexico and will be a wonderful resource to talk to. He is going to going over my MRI results with the New Mexico doc and I hope to have an answer next week. What he did tell me is again - the Osteochondral Defect means the bone and cartilage have died. Surgery is most likely the best option to heal the injury. Wants to see what the New Mexico doc says and what his plan of action would be. 1. Get down to San Diego as soon as the doc can see me and consult with him. 2. Wait to hear back from the New Mexico doc and my friend. 3. Talk again with my original doc and ask additional questions. The surgery is going to happen, now I just have to make sure I am getting the procedure that is right for me. Also, I want to lay out my long term plans (lifelong runner, marathons are important to me, fast marathons and running is important to me. I have a lot of goals yet that I have not achieved.) to the doctor that I choose to perform the surgery. Ortho surgeons that specialize in athletes understand that for an athlete (even if the athlete isn't a pro - which I certainly am not) their sport is super important and the doctor's focus is properly healing the patient, while still getting them back to their sport. My goal is still to be back to running by this summer. In some ways it feels like such a long, long time and yet I know summer will be here in a blink! I just have to keep cross training and building strength and focus on what's to come. A lot of great running is in my (near) future and I can't wait!! I will definitely update on the blog what is happening and when the big surgical date will occur. Really hoping that we can finalize details and make it happen in early March! But mostly, I am so thankful for the wonderful friends in my life who are doctors and can help lead me in the right direction and give me solid advice (thank you!!). Sometimes I chuckle at the irony of life and timing. I started this blog to talk about running first and foremost. Yes, its about healthy food and healthy living - but the main focus of this blog is running. I am not running right now, but the blog's main focal point will be about running and how to juggle (and enjoy) it all with a busy life. I do truly love food also! Love healthy recipes and I know that what we put into our bodies is so important. I definitely had a sad moment (okay sad 30 minutes) with Jerold tonight. I am so, so thankful for him! He always knows what to say and when to say it. He basically told me to keep pushing, keep working hard and focus on the end result = getting back out there! It will come.... it will come. Have an excellent Tuesday and happy running! Have you ever had a severe injury from running? How did you get through it? What is the longest amount of time you have been sidelined from running? This has been the longest for me (other than pregnancy) - 11 weeks!